Craft distilleries from Sonoma and the surrounding counties will come together for a public tasting benefitting Social Advocates for Youth (SAY). While you’re here, you’ll also enjoy a cocktail competition (you get to vote), food bites from craft food vendors, locally made bitters and syrups and live music. Wine Country Distillery Festival takes place Saturday, February 9 from noon to 4 p.m. at Sally Tomatoes, 1100 Valley House Drive in Rohnert Park. Here are the vendors you can look forward to seeing at the first annual Wine Country Distillery Festival! Tamar Distillery Inc., Redwood Valley – Tamar Distillery Inc., American Craft Whiskey Distillery was founded in 2008, where Low Gap Whiskey, Russell Henry Gins, Fluid Dynamics Cocktails and DSP 162 Vodkas are produced. The distillery uses ancient methods learned during a lengthy apprenticeship with a brandy master from Cognac. Crispin, Tamar’s president applies the old double distillation method used in Cognac for over 500 years to make Low Gap Whiskey and their other products. This allows him to select only the heart of the spirit to save for aging, blending, and drinking, lending a particularly high quality to the finished products. Charbay, St Helena – For 34 years, Charbay has been producing small releases of handcrafted spirits, wines, ports, aperitifs and liqueurs in Northern California. Loch & Union, Napa Valley – Loch & Union’s story began while Colin Baker was studying for his Master’s Degree in Brewing & Distilling at Heriot-Watt University in Edinburgh, Scotland. His interest in distilling eventually became an obsession, which led to the idea of opening a distillery of his own in the Bay Area, which has one of the most vibrant and creative distilling/spirit scenes anywhere. Raff Distillerie, San Francisco – Established in early 2011 by Master Distiller, Carter Raff who’s distilling experience amounts to 17+ years, the distillery sits in the old Navy Brigg on Treasure Island, a most appropriate place for distilling gin, absinthe and rhum. Raff spirits are all handcrafted and produced in lots of 350 gallons or less. 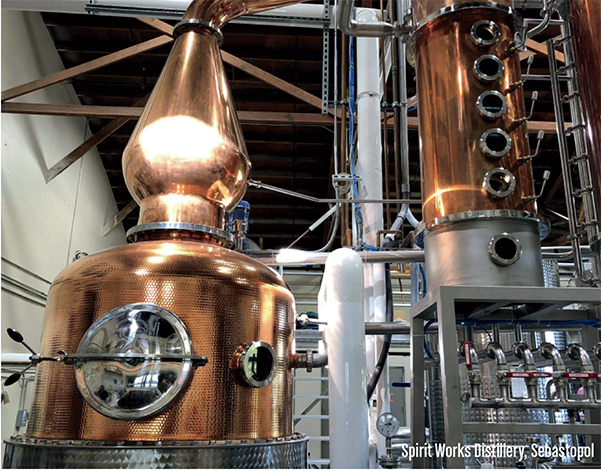 Spirit Works Distillery, Sebastopol – Like their unique Sloe Gin, husband and wife team, Timo and Ashby Marshall bring a combination of traditional British legacy and innovative West Coast style to Spirit Works Distillery. For tickets or more information, visit the website at www.poppyandvine.life/winecountrydistilleryfestival. Tickets are $50 or $45 each if you buy two. For group tickets of six+, or to make this a weekend getaway with hotel and transportation, email: info@poppyandvine.life. In 1971, a group of innovative local leaders established Social Advocates for Youth (SAY) to provide an alternative to youth incarceration and advocate to change laws related to youth homelessness. Today, Social Advocates for Youth helps the most vulnerable young people across Sonoma County by providing housing, mental health care, and employment services. Over the last 45+ years, SAY has helped more than 60,000 children, youth, and families find hope for a brighter future. To learn more, visit www.saysc.org.